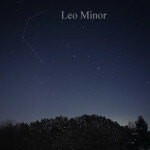 Leo Minor is a northern constellation that walks the sky below Ursa Major’s hind legs and above Leo’s mane. 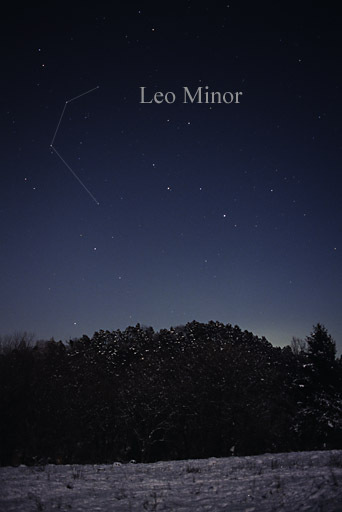 Ptolemy, the 2nd century astronomer that cataloged many of today’s modern constellations, noted that the region of Leo Minor was undefined, and it remained that way until Johannes Hevelius first depicted it in 1687. Lying just outside the circle that defines circumpolar objects, this constellation can be seen most of the night year ’round, and it reaches its highest nightfall ascension in April. There are no Messier objects in Leo Minor, but there are several NGC objects available to the determined amateur astronomer’s telescope. 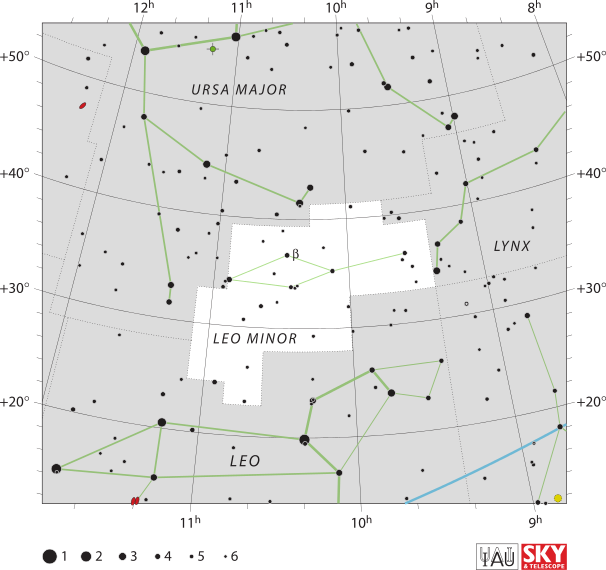 IAU Leo Minor chart, IAU and Sky & Telescope magazine (Roger Sinnott and Rick Fienberg), June 5, 2011.